The Lie-Nielsen #1 and #2 are the smallest of the bench planes, with the lower number being smaller in size. As bench planes, the iron rests on a frog (45 degrees in these two sizes) and is used in a bevel down configuration. Both the #1 and #2 are only offered in Bronze, which is heavier than the same plane would be in Iron, and has the added benefit that the body will not rust. 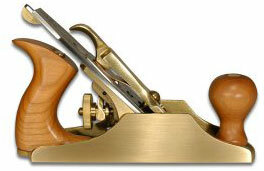 One difference in the #1, compared to the rest of the line of Lie-Nielsen bench planes, is the fact that the body is not modeled along the Stanley Bedrock design. The #2 does follow the Bedrock design, and is offered both in Bronze. Both the #1 and #2 planes come with the A2 iron, and are set up like other bench planes. With the size of the #1, many ask how they should hold it, since it is very compact. While I don’t have the largest of hands, I still tend to hold it a bit differently than most other bench planes. 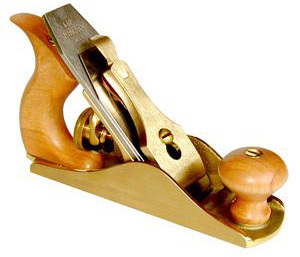 I’ll cup my rear hand around the handle, with my hand in sort of a U shape, and grip it similarly to a block plane. My front hand holds the knob, as you would expect, and makes for a more comfortable long term grip for me compared to the same time with a block plane. Now that I have this way of working with it, there are times I’ll grab my #1 instead of one of my block planes. The #2, while small, is a fair amount larger than the #1. The #2’s size is such that some will feel comfortable using the grip I described for the #1 above, while others will hold it with a standard (although a bit more cramped) grip. I accomplish my standard grip by holding the handle with my lower three fingers, and pointing my index finger forward, very much like holding a saw. With the Bronze body, remember you should still apply some rust preventative on the blade, like Jojoba Oil or Camellia Oil. There are also silicone-treated sacks available for storage. A question I get quite often is why someone would use these smallest bench planes. Even though I recognize the smallest Lie-Nielsen planes are very cute, they all work just as well as their larger brothers (or sisters). I find the scale of work helps me decide which size bench plane to choose for a given project. For instance, I find it easier to use a smallish plane when cleaning up the edges of 1/4” thick boards I use for the sides of some of my dovetailed boxes, rather than trying to balance my #8 jointer on the very thin edges. Another good reason to have a smaller (and shorter) bench plane in your arsenal is when you need to work a small area of a board that doesn’t need to be dead flat, but you still want to finish it with a plane. As you likely know, the longer the plane bed, the more flat is required to take a full length shaving, since the bed rides on top of any crests that might exist. The iron takes material off of the top of the crest, but can’t reach down into the valley. With a shorter plane, and depending on how far apart any crests might be, you can work down into the valley without the need to completely flatten the board first. This way you will still have a planed surface, instead of scraping or moving to sandpaper. I find the #1 and #2 are both extremely functional and quite flexible. Either would be a nice addition to your kit. Click the links to take a closer look at the Lie Nielsen #1 bench plane , #2 bronze bench plane and #2 cast ductile iron bench plane. The Plane Facts: Bench Planes – why are there so many sizes? Which would you suggest for making small boxes, the #1 or 2? I’m 73 and have medium sized hands that are a little arthritic. Both planes are smallish so the rear handle will only be gripped by a couple to three fingers wrapping around the handle using the finger tips. The no. 2 will be a bit easier to grip since the handle is slightly larger with more clearance for a finger wrap. The width of the irons and the overall length (and weight) will help guide him in deciding which one to consider for his small box work. Blade is 1-3/16″ (3cm) x .110″ (2.79mm) thick. Blade is 1-5/8″ wide x .125″ thick.